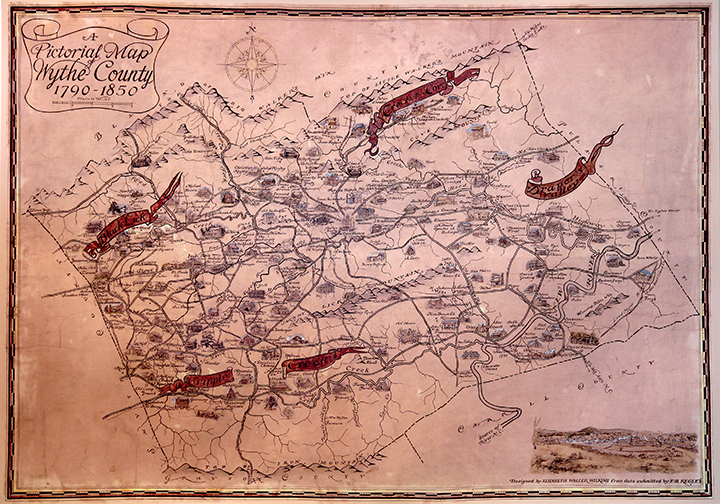 This map, entitled "Pictorial Map of Wythe County, 1790-1850," originally was displayed in the upper hall of F.B. Kegley’s home, Rose Hill Farm, north of Wytheville. According to notes written by Mr. Kegley, the map was commissioned for a contest put on by the Virginia DAR. The artwork for the map was created by Elizabeth Waller Wilkins, a local artist who worked with Mr. Kegley on other projects. The roads shown on the map are from the time period prior to the Civil War. The houses depicted are drawn from photographs that were in many cases taken by Mr. Kegley. Unlike many of the items in the Kegley Library collection at WCC, this map is a one-of-a-kind item. For years, visitors to the Kegley Library have admired the framed map, which was recently restored. Now, the Kegley Library is offering high-quality photographic prints of the map. The size of the reproduction is 20 inches high by 29 inches wide. 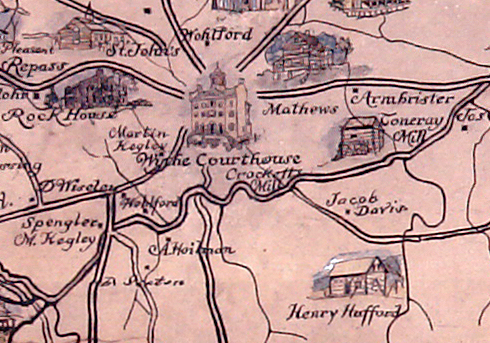 The image below depicts a portion of the map, shown in detail. Copies of the map may be purchased on a walk-in basis for $30. The WCC Library is located in Smyth Hall on the main campus in Wytheville. The item can also be purchased online, using the PayPal link below, but there will be an additional $10 charge for shipping costs, making the total cost $40. Note that the map will be rolled carefully and shipped to you in a sturdy tube to protect the map during shipping. You may purchase a copy of the map via our website using PayPal, an online company that allows individuals or businesses with an email address to securely, easily and quickly send funds directly to WCC. You can use your existing PayPal account or a credit card to make donations. Please click on "Donate" to begin the purchase process. Please use the "Add special instructions to the seller" section to note that you a purchasing a copy of the Kegley map and be sure your mailing address is correct. Be sure to note in the "memo" space on your check that you are purchasing a copy of the Kegley map.